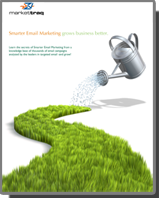 As of last month, there is official confirmation (in this blog post from MediaPost) that email marketing has ended one era and begun a new one: one where engagement metrics from subscribers might soon become the dominant determinant of whether an email message hits your targets eyeballs or disappears into the spam folder without once touching the inbox. This is not a sudden change, and has been in the works (and monitored by MarketTraq analysts) for some time. For instance, it’s been over a year since Google began rolling out their “priority inbox” technology, and Microsoft’s Hotmail has been using user interaction signals (marking a message as junk, opening or not opening a message, automatically displaying images from certain senders, etc.) for some time. In fact, the email providers make no pretense about their intentions. Over and over we’ve heard their vision for a future where email is intelligently sorted through predictive algorithms that track user behavior. With Yahoo’s confirmation, though, we finally have an email provider stepping up and proclaiming that engagement is a much more important feature in determining inbox placement than was previously suspected, and is growing faster than most thought. What does this mean for bulk mailers? Things are about to get much more difficult. Even mailers with no previous deliverability issues may soon find themselves locked out of inboxes. Let us repeat that, because it’s critical: Even senders who do, and have done, everything right may soon find themselves with huge inbox placement problems. What can senders do to combat poor placement when placement is determined by individual actions? The most important thing to do is to keep users engaged by giving them the best email content possible. The three keystones of email marketing, being relevant, timely, and expected, are even more important now. On top of that, though, emails will need to immediately pull users in and do everything in their power to get them to interact with the email. While aiming to convert subscribers into paid customers is still important, it will become just as important to get users to simply open your email, download images, or click a link. These engagement metrics will continue to grow in importance, both for determining whether your emails reach a specific individual subscriber, and for determining how an email provider treats all emails originating from your brand. To that end, we at MarketTraq see a reversal in conversion strategies coming soon. Over the last few years, email marketers have pushed to make emails the penultimate step in the conversion funnel, taking users directly to products, signups, and other final conversion points. Whereas before it was acceptable to trade some level of disengagement by subscribers not interested in the specific products advertised in order to get a higher percentage of final conversions, now it is far more important to increase engagement metrics at the earliest stages, sacrificing some back end conversions for the greater good of keeping your emails out of the spam folder. Segmentation is going to become far more important as individual user actions are going to play a much bigger role in determining the overall deliverability for your list. While keeping a clean and well-segmented list has always been important, there has never been a strong incentive to completely purge entries off your list. Well, the incentive is finally here. Since completely unengaged users will begin to hurt your deliverability across your list, it is finally time to cull them. Begin segmenting off your users by level of engagement, and treating each group as entirely separate lists with entirely separate mailing strategies. Those subscribers who are completely uninterested and have not responded to, or even so much as opened, an email from you in months need to be cut from the list, or at least added to a suppression list until the viability of re-engagement can be ascertained. Those who only rarely engage with your brand need to have the frequency of their mailings markedly decreased, and the focus of their messaging shifted sharply towards re-engagement. This should be an ongoing and continuous process, that checks itself after every mailing. This could be a great time to begin using the MarketTraq’s Engagement Score feature to both automatically segment your lists, as well as to dynamically change content (using our M-Blocks) to try to save disengaging subscribers before they either become a liability or need to be cut. Finally, monitoring and tracking practices will need to change. Seed accounts, long a standard of deliverability testing, will become less and less reliable. Since these accounts are permanently disengaged, they will register far lower inbox placement percentages than might actually be the case. Instead, engagement metrics like open and click rates will become far more important proxies of inbox placement rates, and will need to be monitored far more closely for changes. Aggregate engagement metrics across individual email providers will also become critical to keep an eye on. A sharp drop in engagement on one email provider may be a signal that your messages are being filtered and not reaching inboxes, especially if engagement from other providers remains steady or increases. Ultimately, we are a long way from engagement metrics being the sole, or even the most important, metrics used to determine placement. During the transition, traditional trust and reputation factors will remain the kings of placement. Nevertheless, the change is coming, and it will be at least as dramatic as the other major shifts in the email industry (first, the introduction of white and blacklists, then the birth of the spam filter). The good news is that periods of great disruption present perfect opportunities for brands and companies to overcome and shine. If ever there was a time to claim the “king of the inbox” title, this is it. Good luck, and keep ‘em clicking!